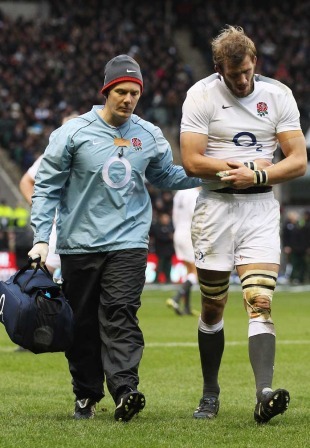 England flanker Tom Croft suffered a fractured right shoulder in Saturday's 21-11 defeat to South Africa, the Rugby Football Union have confirmed. Croft, who spent the night in Charing Cross hospital, will see a specialist this week to determine whether further action needs to be taken. The initial indications were that Croft could be fit for the start of England's RBS 6 Nations campaign against Wales in Cardiff on February 4. But the 25-year-old will only have a clear timescale for his recovery once he has seen the specialist. More immediately, Croft is set to miss Leicester's Aviva Premiership clash with London Irish next weekend and the Tigers' back-to-back Heineken Cup encounters with Perpignan next month. Leicester fly-half Toby Flood and Northampton wing Chris Ashton have both recovered from blows to the head and will return to their clubs for further checks. Sale fly-half Charlie Hodgson suffered a bruised foot and will also undergo reassessment on return to his club.